STAR WARS AFICIONADO WEBSITE: "CLOSE ENCOUNTERS" WAS NEVER LIKE THIS! 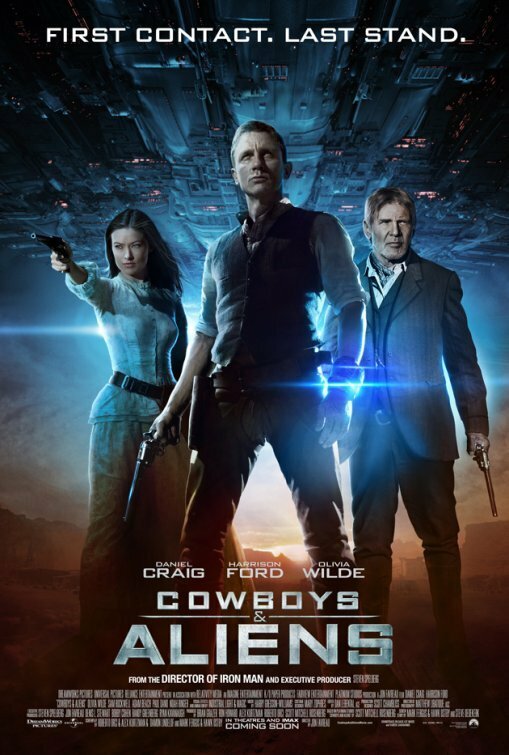 "COWBOYS & ALIENS" ARRIVE! "CLOSE ENCOUNTERS" WAS NEVER LIKE THIS! 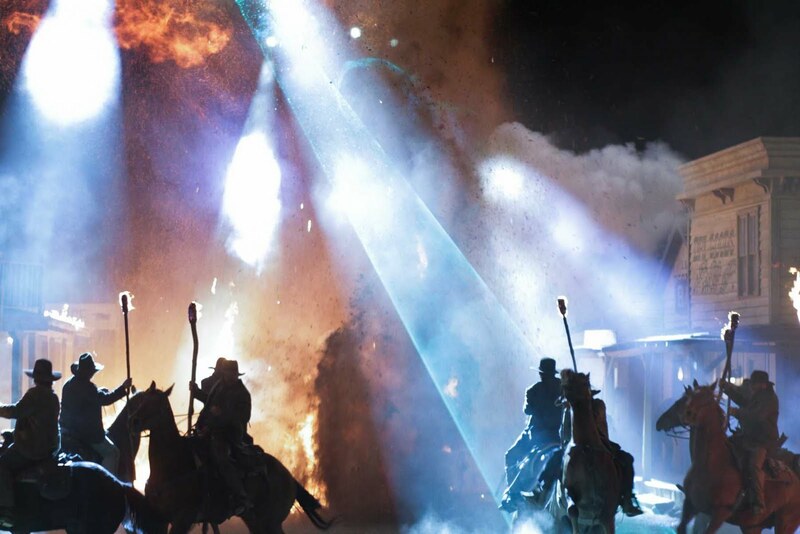 "COWBOYS & ALIENS" ARRIVE! Starring in this cool retro poster art, Daniel Craig leads the charge against alien aggressors in the upcoming COWBOYS & ALIENS. Images: PARAMOUNT UK. It's time to load those pistols, saddle up your fastest horse and get ready for action Way Out West as the dream film-making trio of Jon Favreau, Steven Spielberg and Ron Howard gather their imaginations and predilections for all things cool in concepts and movies and team up with the equally iconic on-screen pairing of youth and experience-Daniel Craig (swapping his James Bond using Walther PPK for the most futuristic and alien tech device yet!) 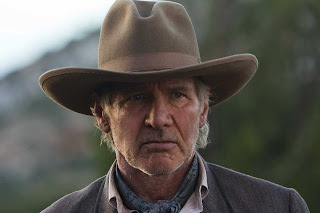 and Box Office Champ and film legend Harrison Ford (who keeps a similar character defining hat to the likes he wore for INDIANA JONES, but changes his bull-whip for a rifle instead)- for the ultimate tale of heroism against the unfamiliar. The "unfamiliar" being a hidden agenda carrying horde of alien menaces from beyond our planet, whose bio-technological ships and advanced weaponry hurtle through the western frontier of Arizona in search of Human prey in the epic motion picture COWBOYS & ALIENS, based on the acclaimed graphic novel written by Scott Mitchell Rosenberg, and hitting the big screens of the US from 29th July and in the UK from 19th August. A savage attack on the residents of the town called Absolution! 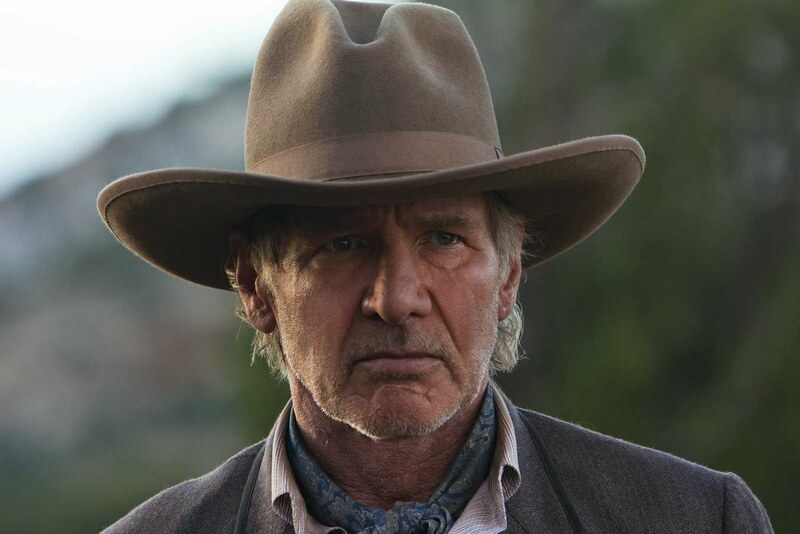 Harrison Ford plays mean old Col. Woodrow Dolarhyde. He always gets his man! Or Alien! The lovely Olivia Wilde as heroine Ella. With a terrific ensemble cast who look tailor made for the cross-genre dramatic and physical conflicts, including the lovely Olivia Wilde (enjoying the crest of the wave of acting success with her super performance in TRON: LEGACY, as well as regular popular appearances in the hit NBC UNIVERSAL series HOUSE) as the mysterious Ella, who may also have a past connection with love interest Craig (playing the amnesiac fugitive soon on a quest of re-discovery, Jake Lonergan), plus the always consistently excellent Keith Carradine as Sheriff Taggart, the deep voiced, perfect for gritty westerns face of Clancy Brown as Meacham, and the always quirky Sam Rockwell as Ford's associate, Doc, this is one tale of alien invasion and excitement that's guaranteed to deliver all the hotly anticipated thrills, spills and blockbuster entertainment you can hope for, against a realistic and uncliched 19th century western back drop that keep its own highly successful dramatic and visual ingredient, plus its all-important integrity- intact amongst the spectacular fireworks! STAR WARS AFICIONADO MAGAZINE: FIRST LOOK: "COWBOYS & ALIENS"
What will Jake Lonergan (Daniel Craig) bring to the fight against the not from this Earth menace? 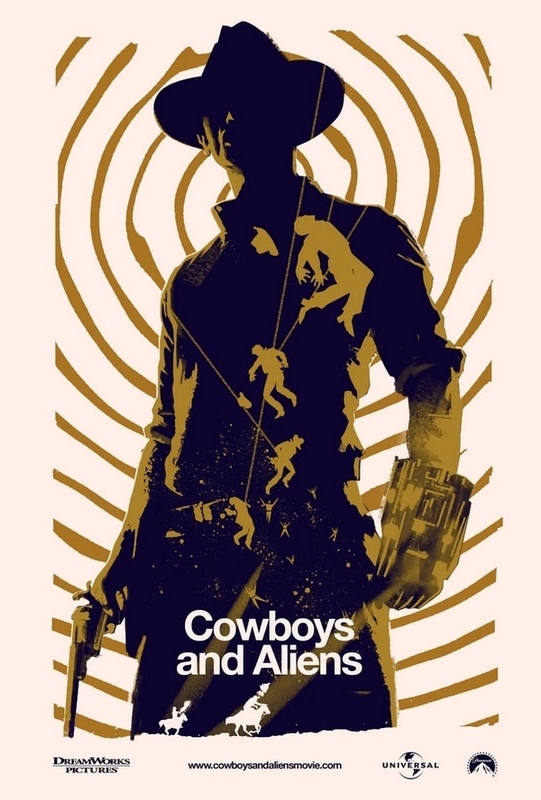 The terrific 2011 worldwide release poster for COWBOYS & ALIENS. 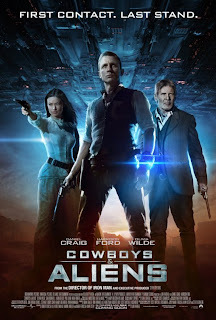 AFICIONADO REVIEW: "COWBOYS & ALIENS"
NOT QUITE THE WARM REUNION WE WERE HOPING FOR...! 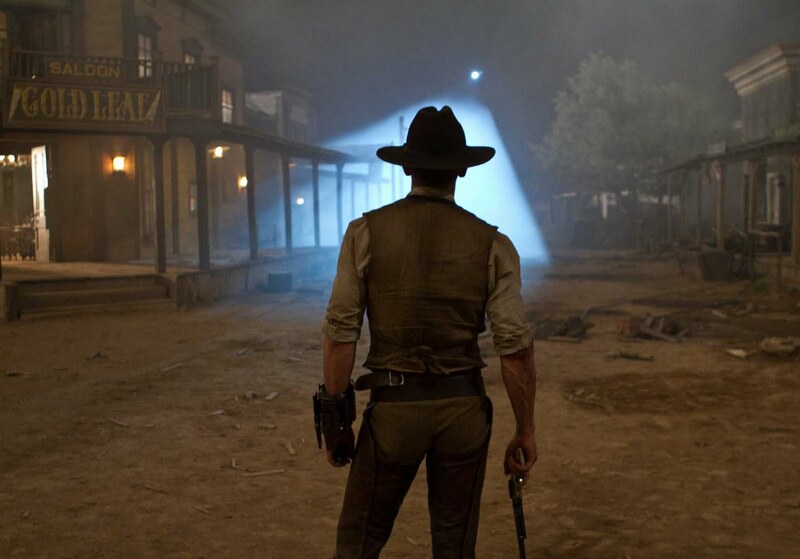 "COWBOYS & ALIENS": WHEN BLOCKBUSTER STARS MEET! DELETED SCENES GALORE COMING ON BLU-RAY! IRON WOMAN! THE RETURN OF "THE CLONE WARS"
BEHIND THE SCENES: IN THE SHADE! CLASSIC RAIDERS: COMES A HORSEMAN! OUT NOW ON US BLU-RAY: "AMERICAN GRAFFITI"
BEHIND THE SCENES IMAGE: IMPERIAL LINE-UP! BEHIND THE SCENES IMAGE: REBEL CAPTURE! SCENES WE WANT ON BLU-RAY 6: JEDI TEMPLE TRAP! CLASSIC IMAGE: HAVE YOU SEEN THIS WOOKIEE? BEHIND THE SCENES IMAGE: WAMPA IN THE WILDS! CLASSIC IMAGE: THE HUNTRESS STRIKES! CLASSIC RAIDERS: SPIELBERG'S ACTING CLASS! CLASSIC IMAGE: CONVERGENCE OF GOOD AND EVIL! ILM CLASSIC IMAGE: GLAMOUROUS SPACE-FARER!